The report – released on April 24, 2018 by the World Green Building Council – highlights tangible economic and cultural benefits of sustainable design. The report entitled Doing Right by Planet and People: The Business Case for Health and Wellbeing in Green Building features our design for Plantronics’ Soundscape Building as a case study to show the real-life benefits on employee engagement, satisfaction and productivity. The pioneering building is located in the innovative Park 20|20, the first Cradle to Cradle inspired development in the Netherlands. William McDonough + Partners worked alongside Plantronics, Delta Development Group and N30 to bring the vision for the building to life. The building was designed to show how the right mix of acoustic expertise, state-of-the-art technology and biophilic design can benefit employee collaboration, concentration and productivity. Plantronics’ Soundscapes Building integrates our Cradle to Cradle® design approach, creating a building that promotes health, wellbeing and ‘smarter working solutions’ through abundant daylight, clean water, indoor air quality and healthy materials including Cradle to Cradle Certified™ products. The building is designed for disassembly with a high-performance envelope featuring vegetated walls and rooftop integrated photovoltaic panels. Notably, active acoustic management features use both sights and sounds from nature to manage noise in the open plan workspace. The result is a symphony of sound layers that make it possible for diverse activities to take place simultaneously with minimal disruption. Three waterfalls within the office work in concert with Plantronics intelligent sound management solution to manage acoustics. This biophilic design not only supports associates’ need for privacy, but also plays to humans’ innate connection to nature. 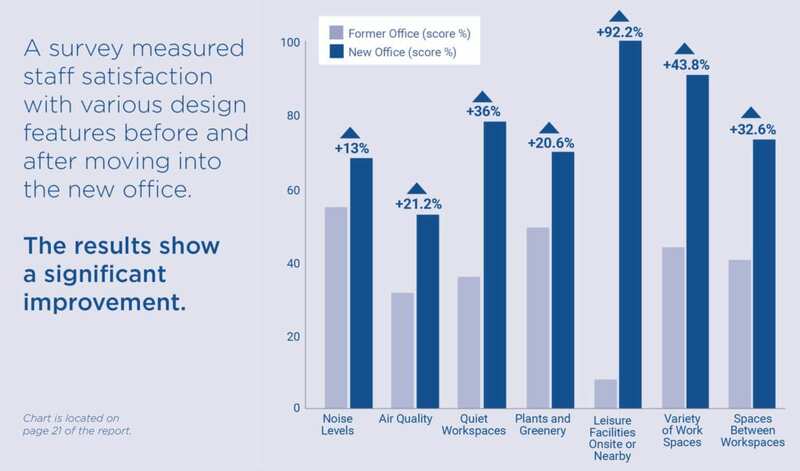 According to the report, a post-occupancy survey using the Leesman Index revealed significant improvements in employee perception of the workplace features and services supporting their health and their ability to be productive. The Leesman Index score (Lmi) of 82.3 represents a 6.6 point improvement on the previous office and remains one of the top 10 scores achieved globally (among companies with 50 or more employees) at the time. Throughout the building, every effort was made to conserve natural resources, from solar panels to carpets fabricated from recycled fishing nets. The facility includes solar cells that are designed to harvest at least a quarter of the building’s required energy from the sun, and its water systems include greywater harvesting, filtration, cleansing and reuse. These efforts have resulted in the building receiving a Building Research Establishment Environmental Assessment Method (BREEAM) rating at the ‘Excellent’ level. Learn more about the Plantronics building design here.